Jennifer Lawrence is as good as ever, and she and Bradley Cooper have a chemistry that makes them a formidable team. Jennifer Lawrence (The Hunger Games), Bradley Cooper (Silver Linings Playbook), and Robert DeNiro (The Intern) have teamed up several times on film in the last few years. Their latest venture is a semi-true story about a down-on-her-luck single mother who invents a new way to mop the floor. Joy, out in stores now, combines heartache, with hope and dreams, to mixed results. The movie is based on the real life story of Long Island single mom Joy Mangano, an entrepreneur and business woman known for inventing the Miracle Mop. Joy (Lawrence) was a single mom with a mother (Virginia Madsen; Sideways) who never left the house, a father, Rudy, (DeNiro) who owned a metal works shop and fell in love often, a half sister (Elisabeth Rohm; American Hustle) who was always jealous of her and an ex-husband (Edgar Ramirez; Point Break) who lived in her basement and tried to make a living as a lounge singer. Joy was high school valedictorian with a great deal of wasted potential. When she is forced to leave her job as an airline gate attendant she doesn't know what she is going to do, but fate steps in and she finds her self-inventing a self ringing mop. Mortgaging her home to try and create the product she so desperately believes in, and hung all her dreams on, she comes up against cynics and crooked business people. However, that all changes when a chance meeting with Neil Walk (Cooper) lands her on QVC selling her mops to housewives across America. Lawrence is as good as ever, and she and Cooper have a chemistry that makes them a formidable team. DeNiro is a genius and an American Icon who can do no wrong, even when he is cast in less than stellar films. The rest of the cast rounds out the scenario nicely and Ramirez holds his own against seasoned stars including Isabella Rossellini (Blue Velvet) as Rudy's latest love interest and Joy's financial backer. The Blu-ray is presented in 1080p High Definition video and DTS-HD Master Audio 5.1 which is standard nowadays. The picture is intentionally grainy to give the feel of the 1980's and the costume and set designs fit right into place. The extras are minimal and includes Joy, Strength and Perseverance, a look at the characters with some interesting interviews and Times Talk with Jennifer Lawrence and David O. Russell and Maureen Dowd where the three sit down in front of a live studio audience to discuss the film and process among other things. While not the best Lawrence/Cooper/DeNiro/Russell collaboration the movie mostly held my interest and kept me emotionally invested. The underlying feeling of hope, covered in a layer of despair, is all to familiar for quite a number of Americans and director David O. Russell (Silver Linings Playbook) pulls those feeling out beautifully. Though not critically acclaimed, Joy held my interest and made me want to watch to the whole thing, even though I already knew pretty much how it would end. While not on par the Silver Linings Playbook, the trifecta of leading actors along with a solid supporting cast makes this movie worth seeing, if only once. Download Joy from the iTunes Store in Digial HD. 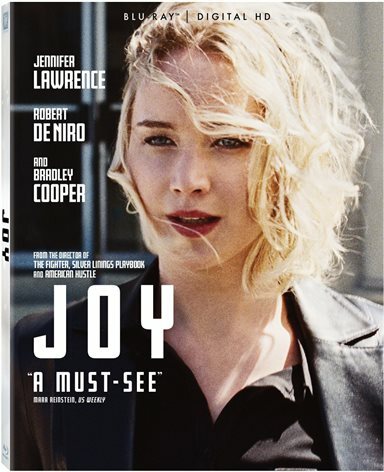 For more information about Joy visit the FlickDirect Movie Database.